The big step of moving from an early intervention centre or kindergarten to school is both exciting and challenging for a child with a developmental disability. Schools can be large places in terms of buildings, grounds and the number of children and staff present on a daily basis. There may be up to 25 students in a class however, many schools are open plan, this means there could be three or four classes of students all in the one learning space. 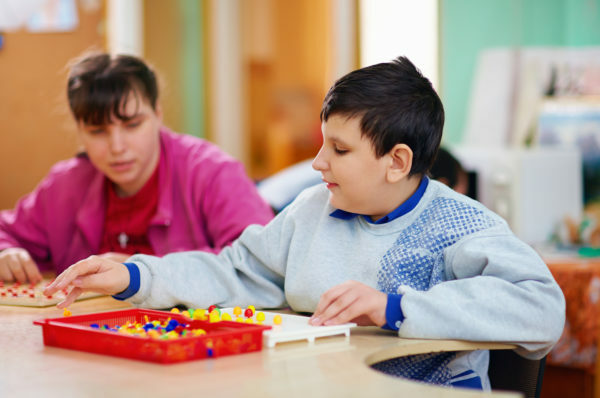 If your child also has a learning disability such as Intellectual Disability, an Autism Spectrum Disorder(ASD) or Attention Deficit Hyperactivity Disorder(ADHD) then further considerations needs to be made. As a parent you need to think about what environment your child is going to need to support his/her learning needs. A starting point would be to talk to the professionals already working with your child. What environment are they suggesting for your child and how do you feel about their recommendations? Your choices are your local neighbourhood mainstream primary school, a non-government school, possibly a specialist school for children with ID or a mix of both, this is called a dual enrolment. Have a look at the school’s website to inform yourself, see what they offer and create some questions prior to organising a meeting with school staff and having a tour of the school. Next step would be to make appointments with as many schools as you can to get a feel for what they can offer your child. You need to decide at this time whether you take your child with you to this initial visit or take them with you on a second visit. Have your list of questions to take with you so you can compare schools. A checklist will help to guide your thinking and questioning of the potential schools. Check out our Primary School checklist and our Special School checklist for more on this. Once you have made your visits and have had your questions answered you will be more informed and able to make a decision. You may wish to consult back with the professionals currently working with your child to discuss your findings. Remember you can always arrange a second visit to ask further questions. To assist with this decision making process and to streamline the process of enrolment make sure you have your paperwork organised as this will be the next step.